Grading Indian Head pennies is a skill that will take years of experience to perfect, but this guide will get you started. Remember that coin grading is the expression of an opinion that describes the condition of a specific coin that most dealers and collectors would agree with. Grading Indian Head pennies is not an exact science where a precise method can be applied, and everyone comes out with the same result. But over the years, numismatists and coin grading services have agreed upon specific definitions, descriptions and Sheldon's numeric values that help all coin collectors describe their coins correctly (to a certain extent). Early Indian Head pennies (1859-1864) were made of 12% nickel and have a slight silver hue to them. The addition of nickel to the alloy made the metal harder than a coin that made with 100% copper. The harder metal alloy made it difficult to get a crisp strike showing all the detail of the design. Beginning in 1864 the nickel was removed from the composition and replaced with 95% copper and 5% tin and zinc. This new alloy made the metal softer and easier to strike. 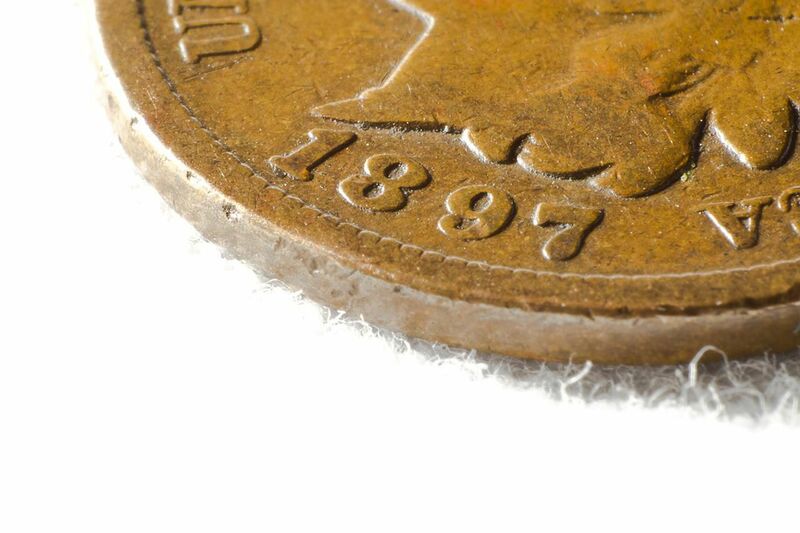 Since nickel was eliminated from the alloy, coins were now more susceptible to toning. Therefore, grades of mint state or uncirculated also take into account the color of the copper coin. The color of the coin is designated as red (RD), red/brown (RB) or brown (BN) and listed after the numerical grade. For example "MS63RB". The highest points on the coin's design will be the first to experience wear from being in circulation. This photo illustrates the highest points on the Indian Head penny design as indicated by the color red. If you think you have an uncirculated Indian Head cent, look at these areas on the coin to see if you can spot any wear. Tilt the coin from side to side under a good light. If the mint luster on the high points is unbroken, then the coin is uncirculated. If there is wear, then it is not uncirculated. Summary: The coin is very heavily worn and barely legible. Some of the devices, lettering, legends, and date may be worn smooth, but the date is readable. Portions of the rim blend into the lettering. Obverse: The Indian's head shows very few details and is almost just an outline. The date is barely readable and some of the lettering merges with the rim. Reverse: The wreath and bow are flat and just an outline. The lettering is flat but readable. Indian Head Cent Graded Good (G04). Summary: The coin is heavily worn overall. The devices, lettering, legends, and date are readable but may have some faintness in a few areas. All major features are visible in at least outline form and the rim is mostly complete but may be incomplete in a few spots. Obverse: The head shows slightly more detail but is mostly just an outline. The rim is full and complete and does not merge with the field. Reverse: The wreath is worn flat but the rim is complete and separate from the field of the coin. Summary: The coin is well-worn. The design is clear and major elements are defined but are flat and lacking in detail. Reverse: The tops of the leaves on the wreath are worn smooth and more detail is starting to show. The bow and ribbon are mostly flat. Summary: The coin shows moderate even wear over the entire surface of the coin. The major design elements are bold and all lettering, legends, and date are clear and readable. Obverse: "LIBERTY" is readable but weak in spots. A quarter of the details now shows in the hair. Details in the feathers are now becoming apparent. Reverse: Some details are visible in the bow and wreath. The high points of the leaves are worn smooth and some may blend with the lower leaves. Summary: Moderate to minor wear exists only on the highest parts of the design where a slight flatness is beginning to show. The overall condition of the coin is pleasing and attractive. Obverse: "LIBERTY" is full and complete but may not be extremely sharp. The headdress shows some flatness but details are starting to emerge and finer details of the feathers are now apparent. Reverse: Only the tips of the leaves on the wreath show signs of wear. The bow shows flatness on the higher points but is distinct. Summary: Has only the slightest wear on the very highest points of the coin. All details are sharp and all design elements are well defined. Some traces of mint luster may still exist. Obverse: "LIBERTY" is full and sharp. The tips of the feathers show only minor wear and are well defined. Wear is evident on the hair above the ear but is well defined as are the curls by the neck. The diamond design on the ribbon by the neck is evident. Reverse: The leaves and bow exhibit wear only on the high points. The leaves and bow are crisp and detailed. Indian Head Cent Graded About Uncirculated (AU55). Summary: There are very minor traces of wear or abrasions are visible on only the highest points on the coin. Mint luster is almost complete and the surfaces of the coin are well preserved. Obverse: Small traces of wear are detectable only on the highest points of the design (see photo above "Design High Points"). Some mint luster still remains. Reverse: Minor traces of wear are evident on the high points of the leaves and bow on the wreath. Summary: No traces of wear from circulation exist. Mint luster is complete but shows minor impairments. Many contact marks, bag marks, and hairline scratches exist on the coin's field and major design elements and are visible without magnification. Overall, the coin has an attractive eye appeal. Obverse: Mint luster is complete over the entire surface of the coin. There may be five to ten marks on the coin's surface. Reverse: Mint luster is complete, even on the wreath and bow. Five to ten marks are permitted on the surface of the coin. Summary: A high quality of mint luster completely covers the surfaces of the coin and is undisturbed. Contact marks and bag marks are few and small. The coin is well struck and a few hairlines may be seen under a magnifying glass. Overall the coin is brilliant and has an above average eye appeal. Obverse: the surface is pristine with only a few small marks evident without magnification. Color may be red, red brown, or brown. Reverse: A few small marks on the wreath and bow are permitted. Mint luster is full and complete. Having been a coin collector for many years and I have witnessed the evolution of coin grading standards over the last forty years. Most recently, I have studied coin grading with professional coin graders from NGC and PCGS. I have read many books and worked with many coin dealers to sharpen my coin grading skills. The information presented in this article is my opinion on how to interpret the many coin grading standards that you will encounter. This is not a universal, absolute and definitive definition on how the Indian Head cent series should be graded. I recommend the following books to help you further develop your coin grading skills.